Take the N1 Bloemfontein, turn off at the William Nicol offramp. Proceed down William Nicol and turn Right into Peter Place. Turn right at the 3rd traffic light into Brian Street. Turn right into the 2nd entrance, Coachman's Crossing Office Park, Block B.
Pagel Schulenburg Inc specialises in corporate commercial litigation, collections on a large scale, mergers, acquisitions & Joint Ventures, contracts & civil litigation and conveyencing. 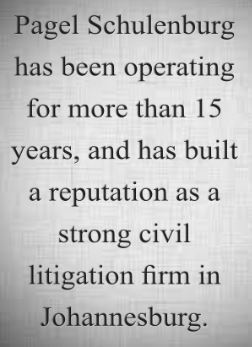 Pagel & Schulenburg Attorneys were formed in May 1997. They specialise and have 15 years experience in corporate commercial litigation, contracts and divorces.